Relatives, friends and fellow artists gathered at the First Cemetery of Athens to say their last goodbyes to famous Greek singer Demis Roussos who died early on Sunday, January 25. Demis Roussos, who won global fame in the 1960s as a member of the popular group Aphrodite’s Child, died in an Athens hospital at the age of 68, after a long period of hospitalization. The Egyptian born Greek singer had a successful international career and sold more than 60 million records around the world. Demis Roussos, who has been mourned by fans across the world, scored a number one single with Forever and Ever. 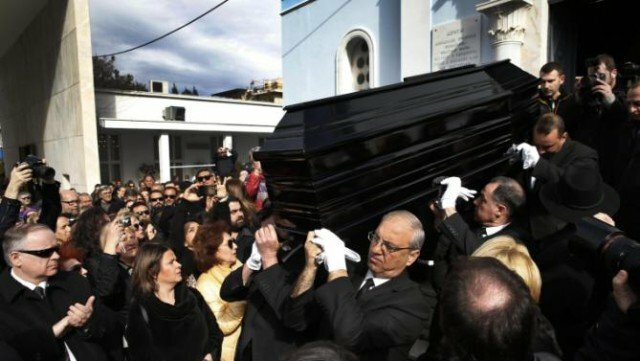 Famous Greek composer, Giorgos Hatzinasios, who was present at the funeral said: “Demis had a unique, unrivaled voice. He was a very happy man. I feel that Demis never grew up and kept hold of his childhood innocence. Several Greek artists such as Nikos Aliagas, Mariza Koch, Dimitris Iatropoulos and people from the Greek political scene, Undersecretary of State Terence Quick, former Greek Parliament Speaker, Vangelis Meimarakis and Marathon Mayor, Ilias Psinakis gathered to say their last farewells to Demis Roussos. “His was a voice which awakened emotions in people and honored Greece wherever it reached. We bid farewell to Demis,” said Mariza Koch. The ambassador of Egypt, the French Embassy, Greek musician Vangelis Papathanasiou, Nana Mouskouri, the Mayor of Athens, Giorgos Kaminis, current Greek Parliament Speaker Zoi Konstantipoulou and the record company Minos-Emi sent wreaths in honor of the beloved singer’s memory. Demis Roussos put his international success down to the advent of cheap air travel opening up Europe to regular holidaymakers.